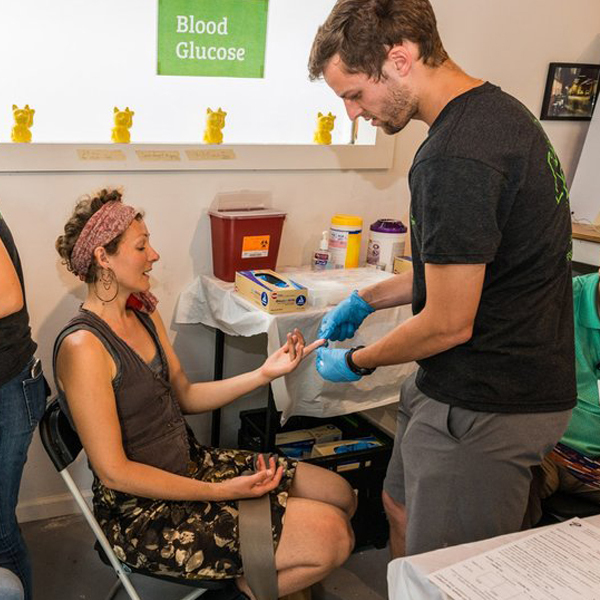 In April 2017, Fusebox Festival invited the Design Institute for Health to join their work with local artists and students from Eastside Memorial High School and East Austin College Prep to create a community café where art, health and food are brought together to give a taste of what can make you feel better. What can you do today to start feeling better tomorrow? We brought in UT pharmacy students and Dell Medical School students for health screenings and consults. This prototype explored if and how art, health and food might live together and relate to each other in a community space as well as how healthcare providers might engage differently with the East Austin community. How might we invite the community to co-design experiences that weave health into daily life? Create a community café where art, health, and food are brought together to give a taste of what can make you feel better. Starting the conversation with a question about how someone wants to feel better tomorrow is an effective way into a conversation about health and health screenings. Co-designing with high school students from the East Austin community brought an authentic understanding of place and nurtured a sense of empowerment about their role in their future. The community found hope in the students’ hope and ideas imagining their community’s future. ~ 100 people attended, with almost half participating in a consult and a third who went through at least one screening. While Fusebox Festival was a great creative partner and event in East Austin, its audiences don’t necessarily represent that neighborhood. Next time we’ll take the café to an event or gathering that draws people primarily from that neighborhood.